Points : 8.7 out of 10. The Dutch did it again. It seems like 2009 will be "the Dutch Female Fronted sensational albums year", because after so many great new albums with a female singer (STREAM OF PASSION, DELAIN, AUTUMN), we can add another. 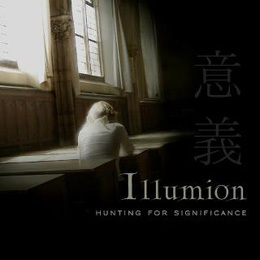 This is the band ILLUMION, which started in 2002 by guitarist EVELINE VAN KAMPEN and bassist/keyboardplayer PETER H. BOER. In the years to follow 3 more female musicians joined the 2 founding members and together they are ILLUMION. The band has a great female lead singer called ESTHER LADIGES and the music is a very unique atmospheric sort of melodic Symphonic/Progressive Gothic Rock, sorta like a mix between MOSTLY AUTUMN, KARNATAKA, MAGENTA, THE GATHERING and a lighter AYREON. Eveline is a superb guitarist, which can be heard very clear on each and every of the 11 included tracks. Most of the songs are very relaxing, with beautiful vocal and guitar melodies, with as highlights Into the labyrinth, Under the harrow, Died for beauty and The bliss. Definitely a CD to check out asap!